Rep. Mike Coffman, R-Colo., gives his victory speech at the Colorado Republican election night party Tuesday, Nov. 8, 2016, in Greenwood Village, Colo. The effort to overturn the FCC’s disastrous repeal of net neutrality hit a significant milestone on Tuesday as the first Republican lawmaker came aboard. Representative Mike Coffman, Republican of Colorado, crossed party lines and joined with Democrats to support using the Congressional Review Act to reverse the FCC decision. 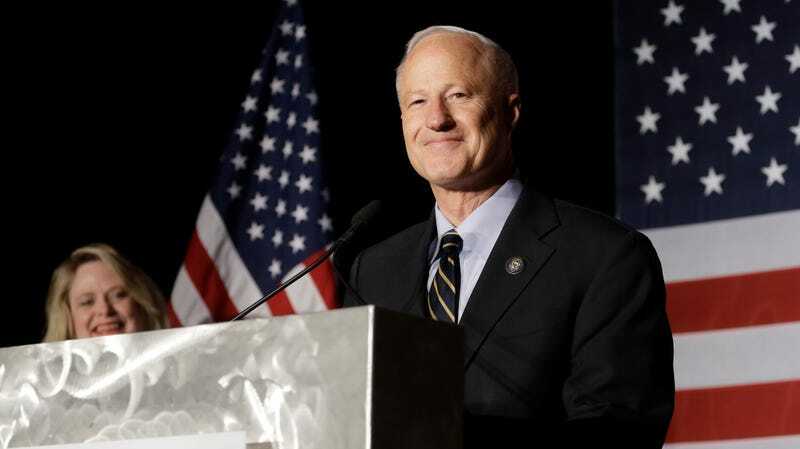 Coffman also introduced his own bill on Tuesday seeking to enshrine into law many of the protections afforded by the 2015 Open Internet Order, which established the net neutrality rules that the FCC’s Republican majority voted to rescind last year. The bill faces considerable challenges in Congress, where other Republican lawmakers have sought to introduce bills that would ultimately undermine net neutrality. Coffman’s decision to support overturning the FCC’s net neutrality repeal using the Congressional Review Act (CRA) received wide praise among net neutrality advocates. Faiz Shakir, national political director of the American Civil Liberties Union, said that Coffman’s decision was the result of growing public pressure that could not be ignored come November. “Other House members should take heed of Coffman’s direction and stand by the overwhelming majority of their constituents, not corporate interests,” Shakir said. The CRA is a resolution that allows Congress to effectively undo any rules passed by executive agencies. A motion to do so passed in the Senate two months ago, with every Democrat on board as well as three Republicans: Senators Susan Collins of Maine, Lisa Murkowski of Alaska, and John Kennedy Louisiana. But the House is much more an uphill battle, requiring 217 lawmakers to sign on before a vote will even be held. Stopping the vote is seen as pivotal to some Republicans, who’d rather not be forced to cast a vote against net neutrality—an issue with strong bipartisan support among voters—so close to November’s midterm elections.